If you are still struggling to find the handbags from one place to another, please come and see handbags in Yiwu. There are many handbag wholesalers in yiwu market; most of them have their own factories. They can design every kind of items you want to. And they can also do your own designs and logos. Thanks to the development of the Yiwu market, the one-stop solution service is becoming more and more popular and helpful as well. Handbag wholesalers in Yiwu are very friendly and helpful, they will offer you the lowest price they can give you, and produce the good quality commodity. 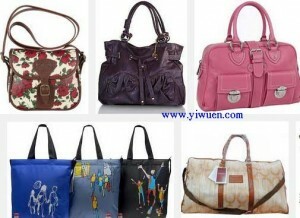 Handbags in Yiwu are in the Yiwu international trade city district 2 on the first floor. This area is about the bags and suitcases as well as umbrellas, raincoats and poly bags. You can find so many kinds of bags in variety materials as well as designs. In a word, it is just a wonderful trip you go through the market. You can find what you want and you may be inspired by some good areas. If you want to know more information, please contact us freely, and we will offer you the best service. Yiwu International Trade City District 2Yiwu market.